How much does it cost to travel to Cartagena? How much money will you need in Cartagena? 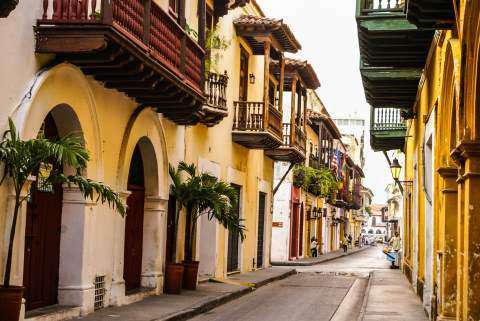 CO$136,325 ($43) is the average daily price for traveling in Cartagena. The average price of food for one day is CO$23,969 ($7.62). The average price of a hotel for a couple is CO$166,668 ($53). Additional pricing is in the table below. These average travel prices have been collected from other travelers to help you plan your own travel budget. The capital of the Bolivar Department of Colombia, Cartagena is one of the most visited cities in the country. It sits on Colombia's northern coast by the Caribbean Sea. It's a port city with a population of almost 900,000, making it the fifth largest city in Colombia. The city has a rich history and was the first Spanish colony on the American continent. It was also one of the first sanctuaries for freed African slaves in the Americas. The peak holidays for the area are the month of December and the holy week when it's a popular destination for Colombians on holiday. The city can be extremely crowded during these times. Cartagena has a tropical wet and dry climate with humidity that is usually around 90%. The rainy seasons are from May to June and October through November. The climate is hot and windy year around. Cartagena's main tourist area is the historic old town, which is surrounded by the city wall. The main entrance to the area is the Clock Tower Building. There are also 500 hundred year old forts in the city that are in surprisingly good condition. The Castillo de San Felipe is a fortress that was built in 1657 by the Spanish. Also nearby is La Popa hill, where you can enjoy great views of the city and the harbour. Museums in Cartagena include the Palacio de la Inquisicion and the Gold Museum (which is free). Churches worth visiting include Iglesia de San Pedro Claver, La Catedral, and the Iglesia de Santo Domingo. Cartagena can be broken down into several areas including the northern area, where you'll find the airport, the downtown, and Bocagrande. As a tourist, you're liking to spend most of your time in the city's downtown and the Bocagrande areas. The downtown is where you'll find the walled colonial part of the city that is called ciudad amurallada. This area has most of the city's high end restaurants, hotels and clubs. Within the walled city you'll find the neighborhoods of Centro, San Diego, Getsemani and the modern part of La Matuna. The oldest part of the city is around Plaza Trinidad in Getsemani. Bocagrande is a strip along the the beach that is lined with hotels and condos. There is also a third area that is up and coming. It's referred to as Castillogrande and has many condos and a nice, quiet beach. There are a variety of activities that you can enjoy while you're in Cartagena. The Chiva Bus is an open air bus that travels around town filled with people drinking, listening to music, and generally having fun. Another fun activity is to take Latin Dance Lessons. You can learn a variety of dances including Salsa, Merengue, Rumba, and Bachata. Spanish classes are also available in town. There are a few Spanish language schools nearby including BABEL International Language Institute, which is found in the old city. There are also many day trips that you can enjoy while you're in the area. There are a handful of picturesque fishing villages nearby as well as some decent beaches. The best beach for swimming is Playa Blanca, which can be visited on an overnight trip. Most hotels and hostels can organize this trip for you. The food in Cartagena is a wonderful mix of the cultures you'll find in the city. African and Arabian flavors show up quite often. A popular dish is a fried meat such as fish, chicken or beef accompanied by coconut rice, fried plantains, and a salad. Food is generally quite cheap, particularly at lunch when restaurants often offer a set menu. If you're in the old town, then you'll find a good selection of restaurants throughout. The largest concentration of options can be found close to the Plaza Santo Domingo in El Centro. It's easy to explore Cartagena's most touristy neighborhoods on foot. Most places are walkable and you'll get a more up close and personal feel for the area if you wander around without a vehicle. If you're hoping to travel to more out of the way destinations such as the San Felipe fort, then there's a great network of buses that are convenient and cheap. If you have any problems just ask the bus driver and they are usually very friendly and helpful. Taxis are also cheap and ubiquitous. They're probably the fastest way to travel around the city.